Ravioli is one of my favorite pastas, and this recipe is for a Pumpkin Ravioli with a Brown Butter Sauce that is one of my all time favorites. It’s a great dish for the Fall, but frankly I’ll cook it just about any time of year. In this particular version, I don’t show you how to make the ravioli itself, as I’m using store bought (and there many great options out there), but I will show you the pasta sauce recipe, and how to put it all together. The dish is very rich, and makes a great appetizer or small plate, but of course you can have the raviolis as a main dish as well. Hope you enjoy them as much as I do. Make sure not to overcook the ravioli, as any ravioli can get very mushy and gross if over cooked. They may also break apart, making the sauce bit sloppy. The pasta sauce is the brown butter, which can be made very quickly (in like 5 minutes) or very slowly (in like 20 minutes) depending on the amount of heat. It doesn’t so much matter what temp you use, as long as you compenstate and use the right amount of time, and make sure the sauce is done with the ravioli is. 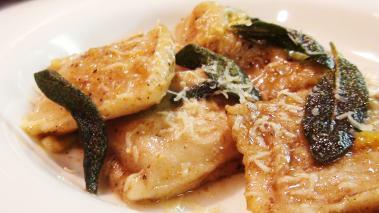 Make sure to finish the ravioli in the pan with the brown butter sauce. Cooking them together for a few minutes allows the flavors to mingle and blend, and you won’t get that if you simply poor the sauce over the ravioli. Hope you enjoy these ravioli as much as I do. Wine recommendation: This ravioli recipe is super rich, super flavor and can stand up to some super big wine. As I have a fondness for regionally pair food and wine, I’m going to suggest you stick with Italy, and try a Barolo wine. It’s a big, bold wine made from Nebbiolo and typically aged for 4 – 6 yrs before release. The tannin will work really well with the brown butter sauce, and the rich pumpkin and sage flavors. Unfortunately, I wouldn't do this one a day in advance. You could brown the butter a hour or so in advance. Then the ravioli should just take a few minutes to cook, reheat the butter while the pasta cooks and add the sage, then put it all together.